The layout of a better designed app. It's astounding how many apps you use only to ask yourself "Seriously, who designed this?" In Melbourne, the most guilty culprits are the Public Transport Victoria (PTV) app and tramTRACKER. These apps are devoid from any actual user feedback or input. These apps are not designed by asking us "What kind of app would you like to help you get from point A to B" but rather "This is how you get from point A to B". Today in the age of Web 2.0, the public has empowerment in how they want to use their technology, and successful applications have embraced the democratization of creating new technologies (Beer, p986), PTV and tramTRACKER seem to be unaware of this. Think of Uber, an app that practically exists as a protest against the substandard service of Taxis. Taxis were the ones saying "This is how you get form point A to B" and Uber asked us how we actually would like to do it. Web 2.0 signalled the shift to user-created content (Beer, p986) and showed us that creating without the input of your users is to lack empathy, and a lack of empathy makes for an incredibly frustrating consumer experience. We use the PTV app and tramTRACKER because we have to, not because we want to. It is a shame that the developers probably didn't even ask themselves "Would I be happy using this application?". But why would they need to? They don't have competition. They don't even need to redesign their app, so I did it for them. Now I was ready to design a rough prototype. Above is the home page / landing page of the application. The first thing to note is the centralisation of the app. Everything public transport related is contained in this app alone. The top icons are trackers for each individual transport vehicle, there is a page for everything myki related, and there is also a journey planner. 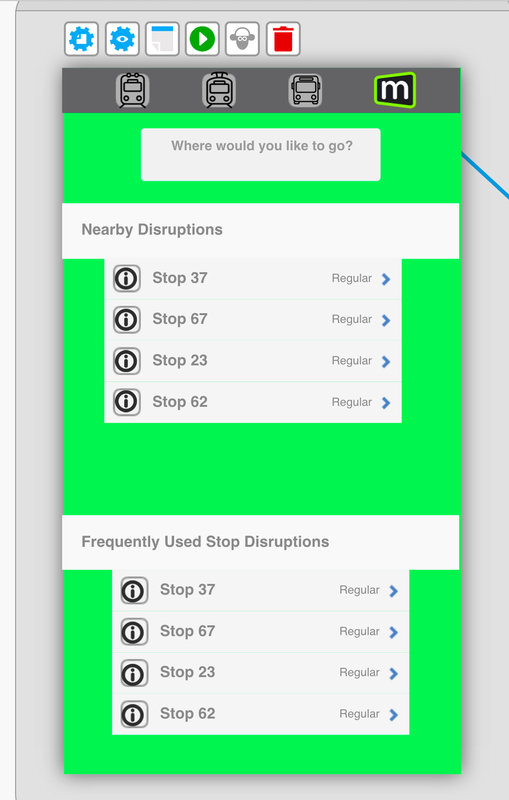 Only information relevant to the user is listed, these being the relevant disruptions of stops nearby, or disruptions of frequently used stops. One thing many people disliked about tramTRACKER is that it would notify you of irrelevant disruptions that had nothing to do with your travel patterns or area. There is also the option to click "Where would you like to go" as an option for a journey planner where the application would map options to get users to their destination. Put in where you are (or use your mobile's gps) and put in where you want to go. In addition to directions, a map is displayed to show you where the different stops are in real time to help with interchanges or just to illustrate the physical stop location. If you already know where you want to go and how you want to get there, simply tapping an icon at the top representing either the tram, train or bus and it will give you the relevant information you need. An example of the tram page. Tapping a specific stop will show more arriving trams and their estimated arrival times. When entering a custom stop, a visual representation of stops around you will appear to help guide the user to nearby stops. Users can also enter a stop by name or number to check real time arrivals. 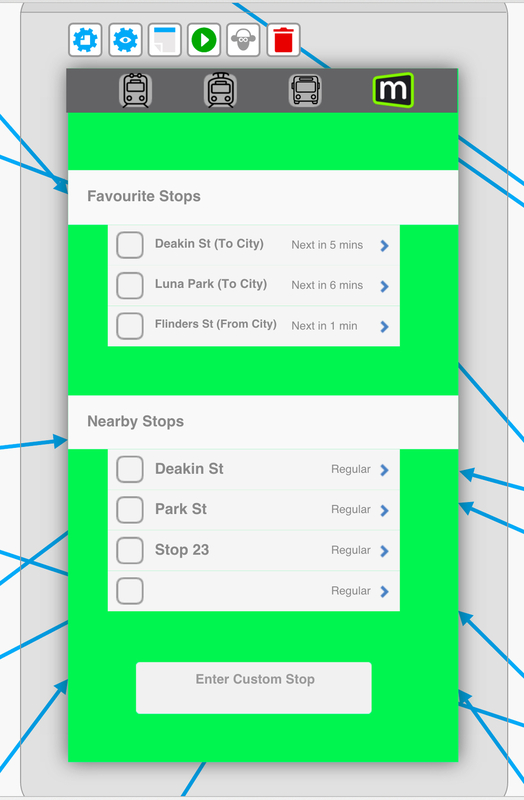 One of the most requested features of the application is the ability to top up myki money in real time. It is bit backwards that you are able to instantly pay an on the spot fine for not having enough to pay for transport, but not able to rectify the problem without getting off the tram and heading to a physical location as topping up online takes 24 hours. The simple solution is to be able to check your balance before you get on, and top up right then and there if you don't have enough. It really should be that simple. All relevant myki information, along with one click instant top up. This application re-design was all about taking two pre-existing applications (PTV and tramTRACKER), merging them together, and applying a human centered design approach to making it better. Improving the application would require some changes to infrastructure such as adding tracking capabilities for trains and buses and improving myki to allow for real time top ups, however these changes are possible and in order to make a better app are necessary. An app is only as good as the foundations it is built upon, and Victoria's public transport foundations do need to improve. With populations increasing in the city by 3.2% annually, the number of those working in the city to increase by 2% annually, the amount of students in the city to increase 2.4% annually, regional visitors up 1.3% annually, and international visitors up 4.7% annually (City of Melbourne), there is going to be more strain and stress placed upon public transport. A more centralised app can help to mitigate these stresses and strains by allowing the flow of people in our cities to continue to move and make patterns predictable so further public transport infrastructure improvements can be made. In part 2, I go through the steps of creating a more targeted transport app and show how a working prototype was used to gather user feedback to refine the app.